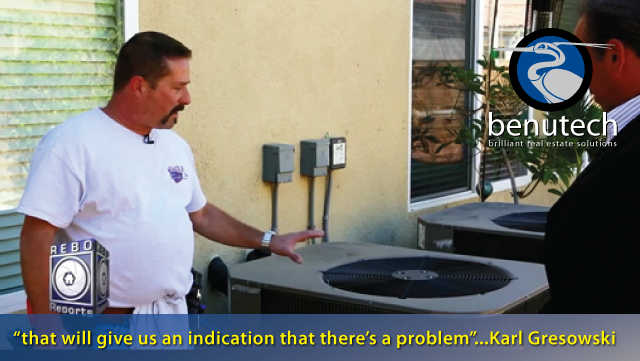 How do you tell if an A/C system might be where critters are entering a house? What should you worry about if you see drips from drain tubes above the windows? Why is there a 4-6 inch gap between the bottom of the stucco and the foundation? When do you need a separate stucco inspector? We’re still not inside the house, but there’s still a lot to learn in this second episode of our series of videos in which our own Tom Iovenitti goes along on a home inspection with Karl Gresowski, owner of and inspector for Eagle Home Inspections. And stay tuned for the next episode, where we’ll explore the side electrical. IOVENITTI: Hello, again, I’m Tom Iovenitti, and I’m here with Karl Gresowski, and we’re here again from Eagle Home Inspections. We’re at the back of a home today, and he’s identified something of interest regarding the air conditioning units. So, Karl, tell us about the air conditioning units. GRESOWSKI: What we’re looking for is to make sure the AC sits 3 inches above grade so water won’t collect underneath it and cause it to rust from underneath. We also want to make sure that they are secured down to the pad. As we can see, they are secured, so if an earthquake happens it doesn’t move off. GRESOWSKI: The other things we are looking for to make sure are that our disconnects are in place, the seal tight is secured to the wall. If we had fuses, we would pull them out, check them, make sure they’re the proper sizes. These are on disconnect breakers. IOVENITTI: You made a comment about the intrusion from outside critters there. Tell us about that. GRESOWSKI: Yes, where the Freon lines are going into the wall slashings here, you can tell, this one’s nicely wrapped. What that does is eliminate any rodents or critters getting into the attic which would cause an infestation on the inside. This one here is done pretty nice. We’ve just got to keep an eye on it every few years to make sure they’re not wearing out. IOVENITTI: So, you mentioned something when we were walking up, and you looked up high and saw a couple of drain tubes hanging out of the ceiling. Tell us what that is in relation to air conditioning. GRESOWSKI: The drain tubes up on top of the eaves over the windows or over doors are the secondary drain lines for the condensation drains. So if we have water dripping out, that means our primaries have been clogged or something’s going on with the A/C units. So we have to have an A/C specialist come out and check it out before we nip the problem interiorly. IOVENITTI: So it’s kind of a warning system for a buyer or seller if they were able to see something like this to immediately call out a professional? GRESOWSKI: Yes. As they’re walking around the house, sometimes we’ll see on the older ones they built 10-15 years ago, where water will be coming out and you’ll see stains on the stucco. And that will give us an indication that there’s a problem, and we need to get an A/C guy out. IOVENITTI: Speaking of the stucco, there was something unique on this particular home, I guess because it’s a newer home, that you identified for settling. Tell us about that. GRESOWSKI: Yes, we have a metal slashing break in the stucco to help eliminate, that helps with the stress cracks and eliminate tension. So when the windows in the stucco are cracking and moving, they’re stopping at that area, that helps absorb some of the settling in the area. And then it eliminates. Right now, in this home, we only have normal settling cracks, which is nice. IOVENITTI: So, in some of the older homes, you’ve made reference to some of the cracks that go all the way up through the home, from the base all the way up to the roof. You would have to get a stucco inspection? GRESOWSKI: Yeah, we’d bring out a stucco guy who looks at that stuff. If we have a lot of vertical and horizontal cracks in the wall, we know something’s going on with the stucco. Was the structure settling a little bit more, the soil, or expansion/contraction, or was it a bad mixture of stucco that was put on the walls? IOVENITTI: Normal things like cracks off the corner of a window, these are just normal settling cracks, you don’t need to be really concerned about. GRESOWSKI: Yes, exactly, unless they have split open wide enough, that we’re going to be concerned with. IOVENITTI: I see. Now, when looking at the foundation side, and you’ve looked at this, something where you have a little relief at the bottom, is that kind of a normal situation? GRESOWSKI: Yes. As you can tell, the stucco comes down, and you’ve got, this is called a leaf screen. This has drain holes in it. So it allows the stucco to drain properly. And then we have our foundation here. So the foundation here, we want this anywhere from about 4-6 inch clearance so we know no moisture can ever penetrate or water get into the house. So this is proper, like right here. This is nice. IOVENITTI: So any separation between a patio may have been just a relief anyway, it’s not just something to be concerned about if there’s cracks along it? GRESOWSKI: Not really. This here’s fine. You can see we have a couple of common cracks, we can see where it settled a little bit, but this is normal. IOVENITTI: Kind of a normal situation? IOVENITTI: Is there anything else on the outside of the house that you’ve identified that we should talk about? GRESOWSKI: I haven’t seen anything else. At this time. IOVENITTI: This is Tom Iovenitti. Stay tuned for our next segment. We’re going to go inside with Karl and see what he can find.